In all cases, the Bible text (as given in book used) must be read and narrated first. Old Testament History,* by T. M. Hardwick and H. Costley-White (Murray, 8/0). Vol. III. pp.115-175. S. H. Macphail (Clerk, 1/-0, pp. 7-89 (c) Helps to the Study of the Bible (Oxford Press, 2/-). (D) The Saviour of the World, Vol. V. (P.N.E.U. Office 8/) pp. 153-193 (e) The Acts* by H. M. Knox, pp. 257-324 (Mamillan, 8/60 (f) (optional) The Prayer Book in the Church, by The Rev. W. E. Campbell. (Longmans, 3/6). pp 1-14 with lessons on the Asscencion and the Trinity. (a) The Romance of the Bible by G. Hollis (Wells, Gardner, Darton, 5/-). pp. 85-168. Dayspring in Uganda by the Ven. A. B. Lloyd (C M. S., 8/-). In the Days of S. Anselm, by G Hollis (S.P.O.X. 3/-) An English Church History for Children, Vol. I by M. Shipley (Mathum, 4/6), pp. 98-165. For private daily Bible reading, children may use Daily Readings from the Old Testament by H. Franklin and L. Montagn (William and Norgate, 2/6). For New Testament: a Gospel in suitable portions. (b) A Boy's Book of Prayer, by A. Devine (Matheu (2/.). Choose and transcribe passages (in beautiful writing from Bridges') Poems of To-day and the other books set, A New Handwriting For Teachers, by M.M. Bridges (P.N.E.U. office, 5d. a card); work from card 6. Dictation (A New Handwriting to be used) . Read on Tuesdays some subject in "Literature" or, on the news of the week, or on some historical or allegorical subject, etc. Write on Thursdays an essay on the subject. Narrative poems that must scan on events that have struck you. Letters to an "Australian Cousin" on general news. Parse and analyse from books read, making progress each term. Meiklejohn's A New Grammar for the English Tongue* (b/. ),pp 45-63, or, Morris's English Grammar* (Macmillan, 1/8) pp 100-126. Arnold Forster's A History of England* (Oassel, 8/6), pages 55-181 (901-1164) Make a chart of the 11th Century (1000-1100) (see reprint from P.R., July, 1910, 8d) Read the daily news and keep a calendar of events. Creighton's First History of France (Longmans, 5/-), pp. 27-45 (961-1154). The British Museum for Children, by Frances Epps (P.N.E.U. Office, 8/6), chapter 11. Teacher study preface. Keep a Book of Centuries (P.N.E.U. office, 2/6), putting in illustrations from all the history studied. The Great War, 1914-1918, by C.R.L. Fletcher (Murray, 6/-), pp. 156-185 (optional). Ourselves, Book I. (Kegan Paul, 4/6), pp. 187-210. North's Plutarch's Lives: Coriolanus (Blackie, 1/-), A Pronouncing Dictionary of Mythology and Antiquities (Walker, 1/6), most important. Social and Industrial Life, by St. Loe Strachey (Macmillan, 2/6), pp. 146-177. The Ambleside Geography Books, Book IV. (4/-), pp. 1-58. Fighting for Sea Power in the Days of Sail, by H. W. Household (Macmillan, (3/-) pp. 146-193. Geikie's Physical Geography (Macmillan, 1/9), pp. 1-19. (Optional), Travels with a Donkey in the Cevennes, by R. L. Stevauson (Chatto & Windus, (3/6). Know something about foreign places coming into notice in the current newspapers. Ten minutes' exercises on the map of Great Britain every week. Philip's Atlas of Comparative Geography (new edition, 3/6), may be used. See also tests under P.U.S. "Scouting." Map questions to be answered from map and names put into blank map (from memory) before each lesson. Children to make maps of new boundaries from memory. Teacher to use The Treaty Settlement of Europe, by H. J. Flanrs (Oxford Press, 2/6). Teacher may find useful Out-door Geography, by e. Hatch (Blackie, (8/-). The Study of Plant Life, by H. C. Stopes (Blackie, 6/-), pp 167-196. First Year of Scientific Knowledge, by Paul Bert (Relfe, 8/-), pp. 107-127. Keep a Nature Note-book (P.N.E.U. Offices, interleaved 2/6), with flower and bird lists, and make daily notes. For out-of-door work choose some special summer study from Furneaux's A Nature Study Guide (Longmans, 6/6), or, Countryside Rambles, by W. S. Furneaux (Philip, 2/6): April to July. Architecture (Jack, 3/6), pp. 86-102. Our Wonderful Universe, by A. Giberne (S.P.C.K., 6/6), pp. 1-27. Pendlebury's "New Shilling Arithmetic," pp. 85-99 (Bell, 2/3). Revise back work; examples may be taken from Pendlebury's New Concrete Arithmetic, Book V. (Bell, 5d.). Important: to be read in leisure time, Number Stories of Long Ago, by D. E. Smith (Ginn, 3/3). A School Geometry, by H. Hall and F. Stevens (Macmillan, Parts i, - iv., 3/6), pp. 77-88, 88 - 93. Revise Theorems 1-12. The School Set of Mathematical Instruments (Macmillan, 2/-). Siepmann's Primary German Course, by G. Siepmann (Macmillan, 5/-), Lessons 10 - 12 inclusive. Teacher study preface, using the lessons (with narration), exercises, grammar, stories, poems, etc., as suggested. Perini's Italian Coversation Grammar (Hachette, 6/6), Exercises 11 - 15, or, better, A New Italian Grammar, by E. Grillo (Blackie, 6/-), pp.1 - 12; 175 - 180. Second Latin Course, by Scott and Jones (Blackie, 3/8), pp. 62 - 88, or, better, Dr. Smith's First Latin Course (Murray, 4/-), pp. 18 - 27. Primary French Course, Part II., by G. Siepmann (Macmillan, 8/-), Lessons 16 - 18 inclusive, with grammar and exercises. Teacher study preface. Read and narrate Le Petit Chose a Paris (Blackie, 4d. ); parse two pages. Read several poems and learn one from Longer Poems for Recitation (Blackie, 6d.). The Fesole Club Papers, by W. G. Collingwood (see current P.R.). Tree studies. Illustrations of seasons from Literature. Study, describe (and draw from memory details of) six reproductions of pictures by Corot (P.N.E.U. Office, 2/- the set). See the special notes in the Parents' Review, April, 1922. Paintbox with specially chosen paints and brush (P.N.E.U. Office, 5/-). 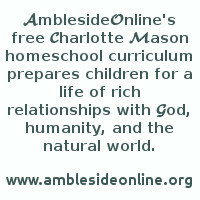 Learn two suitable passages of about 20 verses each from chapters in Bible Lessons. Two hymns. Psalm 18. Two modern poems, or, a scene from Coriolanus, or, two ballads (Historical Ballards, Blackie, 1/-), or two poems from Longfellow. Books set under Literature, History, Geography, Recitations, should afford exercise in careful reading and in composition. Poetry should be read daily. Bulfinch's Age of Fable* (Dent, 2/6), pp. 248-277. See Programme of Music (Grieg), Parents' Review, April, 1922: Our Work (Questions will be set on this subject). The Listener's Guide to Music, by P. Scholes (Oxford Press, 4/-), may be used. Three French songs, French Song, with Music (Blackie, 7d.). Three German songs, Deutscher Liedergarten (Curwen & Son, 2/8, or without accompaniments, 3d.). Three English songs, from The National Song Book, edited by C. V. Stanford (Boosey & Co., words and voice parts 1/9 each*, complete with music 6/-). Ten Minutes' Lessons in Sight-Singing (Curwen, 2/6). Fifty Steps in Sight-Singing, by Arthur Somervell, steps 27-82 (Curwen & Son, 2/6). Ball Games and Breathing Exercises, by Alice R. James (Longmans, 1/9). For Drill Music, Music for use in Mrs. Wordsworth's Classes (P.N.E.U. Office, 9/8), may be used. Peasant Dances and Songs of Many Lands (Evans, 7/6). The Board of Education's Syllabus of Physical Exercises (Eyre & Spottiswoode, 1/8), tables 37-40. Ex-students, House of Education Drills. How to Teach Dances (Evans, 4/6). Tennis. Do some definite house or garden work. Claymodelling, by H. Unwin (Longmans, 4/8). Heaton's Cardboard Modelling (Newman, 6/-): make six models. (Materials from Arnold & Son, Butterley St., Hunslet Lane, Leeds.) Simple Garments for Children, by Synge (Longmans, 6/-). Constructive and Decorative Stitchery, by L. G. Foster (8/6): design and make a garment. Darn and mend garments from the wash each week: First Lessons in Darning and Mending (P.N.E.U. Office, 2d. ), may be used. Teacher will find useful What shall we make? by M. La Trobe Foster (C.M.S., 1/-). See also (unless working as GirlGuides) tests under P.U.S. Scouting (Parents' Review, May, 1920): all girls should take the First Aid (No. 10) and Housecraft (No. 7) Tests. Make a garment for the "Save the Children Fund"; for particulars apply to 29 Golden Square, Regent Street, W.1. N.B. 1.--Each pupil should have a copy of all books, etc... marked * and a set of the Picutes and materials. One copy of the other books is sufficient. N.B. 2.--For methods of teaching the various subjects see Home Education 5/6, School Eduation 5/. (P.N.E.U. Office). In home schoolrooms, Forms III. and IV may work together in all history subjects (including Scripture). N.B. 3.--All books, etc., may be obtained from the Secretary of the P.N.E.U, 26, Victoria Street, London, S.W. 1, as well as exercise books bearing the school motto, 6d. each, and Cambridge paper for the Examination 1/6 for 4 quires (not less); envelopes to match 1/6 a packet. Also the School badge (4/5), School Hat Band (2/6, and Ribbon 2/8 a yard.) Badges stenciled in washing colours on pale blue linen may also be obtained, 4 1/3d. unmounted, 8d. mounted. N.B.4.--Members are particularly asked to follow the Notes under Our Work in the Parents' Review. N.B.5.--This Programme is for Members of the School only and must not be lent. Specimen copies of old Programmes can be obtained by members from the Secretary, House of Education, Ambleside. the School Fee direct to Ambleside. P.N.E.U. subscription, money for books, etc., should be sent to the London Office. N.B. 7.--There is an Association of Old Pupils of the P.U.S. A course of reading is provided. For particulars apply to Miss P. N. Boweer, c/o P.N.E.U. Office.